It was after Norma Kahn's retirement as an educational administrator that she was able to foster and nurture her artistic traits. Just as she had always encouraged others to be innovative and creative, it became clear to her that she would be taking the same path as she began her journey into the visual arts. 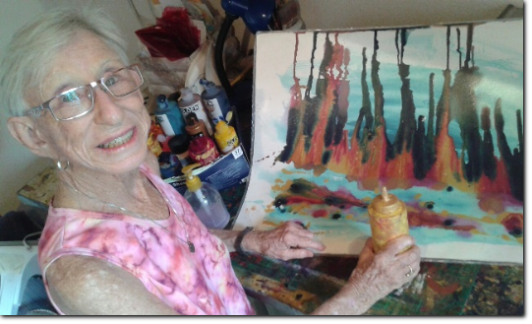 An award winning artist, Norma's imagination and love of color guide her quest within the art world. Using liquid acrylics, she pours, squirts and brushes onto both paper and canvas until whimsical shapes appear. Her creativity and curiosity cause her style to evolve so that each design is unique, which the audience can often view in any direction. She is inspired by her emotions, yet pays close attention to composition. Norma has participated in various art shows and exhibitions in the United States, and now in Costa Rica where she has lived for 18 years. She thrives on the personal interaction with those who appreciate art and loves to hear what people 'see' in her work.